For many, the fall season is a busy time of year. High school, college, and professional sports are in full swing. Kids are participating in homecoming festivities and many families are making trips to their local pumpkin farms. These activities don’t leave much time to get your home projects completed before the snow flies. With the temperatures cooling down and the days getting shorter, now’s the time to prioritize your projects that need to be completed before winter settles in. Completing certain projects now can help you and your home survive winter while looking forward to the return of spring. 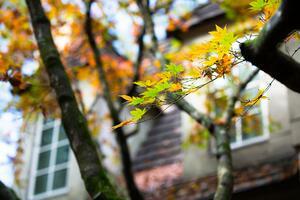 Here’s a list of interior and exterior projects to consider this fall. 1. Dispose of leaves. As a kid, I loved playing in the huge leaf piles in our yard, but I hated raking them. I always grumbled when my parents assigned this job to my brother and me. It did become more fun after my dad bought a leaf blower. While raking isn’t fun, it’s best to get the job done now. Decaying leaves can ruin your lawn and make for a very messy job in spring. Check with your local city government to see if they offer a citywide leaf collection. If they do, this may make your job simpler. If this isn’t an option, check and see if your city’s Department of Public Works has a drop-off yard. 2. Clean your gutters. After all the leaves have fallen, clean out your gutters. Clogged cutters can lead to water damage due to backups or improper draining. They can also cause ice dams during the winter months. If you’re working on a ladder, make sure you have someone to keep it from moving. Also, make sure it’s the right ladder for the job. Avoid standing on the top or over-stretching. A sudden move could cause the ladder to kick out from under you. Lastly, think about what you want to do before making a quick move. 3. Inspect decks, patios, and porches. Remove debris, especially leaves, to prevent staining. Now is also a good time to clean outdoor furniture and prepare it for storage. Covering and storing it in your garage or shed is best. If that’s not possible, cover your furniture with a tarp and make sure it’s secured tightly. Winter winds can be brutal and can easily blow off your tarp. Lastly, secure loose handrails to help prevent guests from slipping and falling when entering or leaving your home during the holidays. 4. Remove garden hoses and shut off faucets. Putting away my hoses is always the last job on my list. There always seems to be one last cleaning project. If your hose(s) are stored in a covered reel, make sure you don’t forget to unscrew them from your faucet(s). Freezing temperatures can cause excess water in the hoses to expand, damaging the faucet and pipes. If you’ve turned off the water to exterior faucets in the past continue doing that. If you haven’t and have freeze resistant faucets, don’t touch them. Lack of use can cause the seals to become brittle. Turning them off now can cause them to leak into your home. 5. Remove or cover air-conditioning units. Removing air-conditioning units from your window is the best option for preventing cold winter drafts from entering your home. If removal isn’t an option, securely cover it with an insulated tarp. If you have a central air unit, consider covering it with a tarp to prevent rodents from using it as their winter home. 6. Properly store your gas-powered tools. One of the easiest things you can do is run your lawn mower out of gas. If you have leftover gas in your mower or gas can, consider adding fuel stabilizer. Adding stabilizer will prevent your gas from deteriorating over the winter months. If you add stabilizer to your lawn mower, make sure you run it for at least five minutes. Don’t forget about your other gas-powered tools such as trimmers, leaf blowers, and chainsaws. Now is also a good time to have your blade(s) sharpened. When spring returns and the growing season starts, you’ll be ready to go. Conversely, make sure your snow blower is filled with gas and it starts. A significant snowfall can sneak up on you quickly. If you’re experiencing problems, give your local small engine repair shop a call. 7. Inspect your home’s exterior. Walk around your home’s exterior looking for roof, siding, or foundation damage. If you find significant damage, contact your local contractor. Fixing the damage now can prevent it from getting worse. 8. Schedule a furnace inspection. Having your furnace inspected can prevent it from breaking down during the months you need it most. In addition, it can help prevent after hour service calls, which can cost a fortune. Lastly, replace your furnace filter. Replacing it regularly helps your furnace run more efficiently. 9. Have your chimney and fireplace inspected. Reading a book or drinking a cup of coffee by a warm fire is relaxing. However, every time a fire is lit creosote buildup can occur. Creosote is a residue that travels up your chimney and builds up on your flue. If that residue isn’t properly cleaned out, the chance of a fire igniting in your chimney increases. Many consider a creosote fire in the chimney one of the most dangerous fires a homeowner can experience; it can spread quickly and severely damage or destroy your entire home within minutes. 10. Clean dryer vents. Lint buildup occurs in your dryer over time, which leads to inefficiency. In addition, heating your home can cause it to dry out quickly. The dryness in your home increases static electricity. Increased lint and static electricity can lead to a fire. If your vent is accessible, take a good look to make sure it’s clear. If not, contact a professional to clean it.